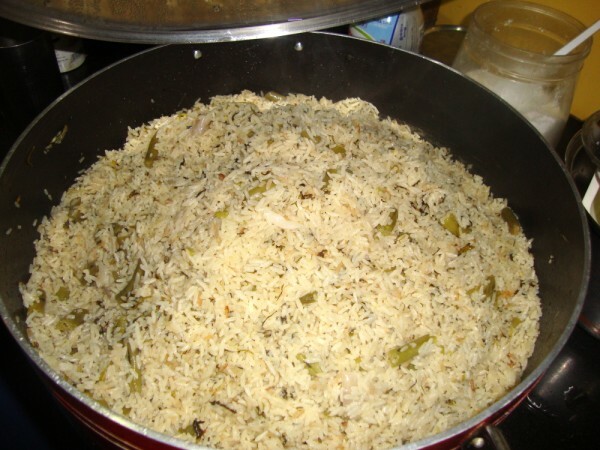 First thinking she would need cooked rice, we cooked 2 kilos of rice along with the rice I needed for Coriander Rice. Later she said she would want raw rice as she wanted to make this sauteed version. 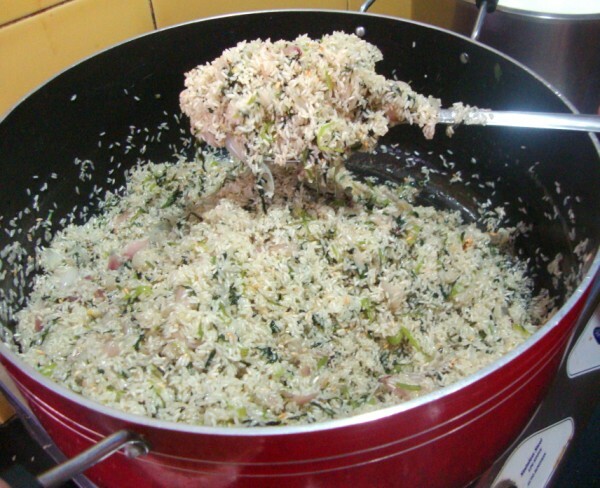 Knowing that only a small portion of this rice may not be enough, we ended up making the same version in two ways and mixed it together. It blended so well. Our Mexican friend enjoyed her stay and loves Indian food. She was most surprised when we expressed the Mexican rice was very much similar to our way of making Rice. She made couple of other recipes that were really very tasty. I will be making those as I didn’t take pictures of them, but have noted down the recipes. Making with pre cooked rice. Chop the onions as julienne, finely chop the coriander leaves. Make a broth of the tomatoes with water and keep it aside. Heat a non stick pan with oil, butter add the onions, coriander leaves, saute well. 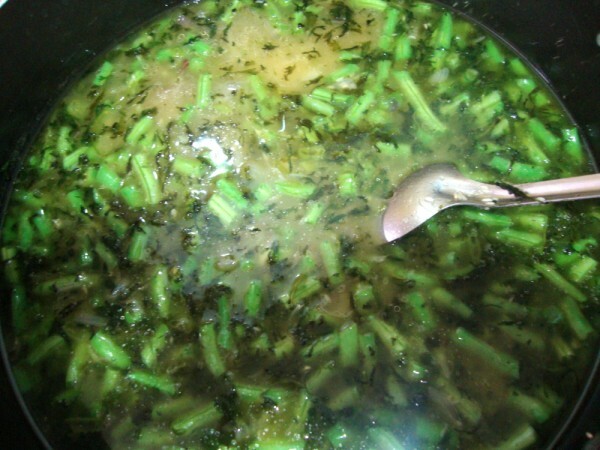 Make a paste of the green chilies, add to the pan. Then add the tomato broth, mix well. Next add the rice and combine everything well. Add 2 cups of water and cook over slow flame until done. This takes about 15 – 20 minutes to be done. Fluff with fork to get everything nicely mixed. 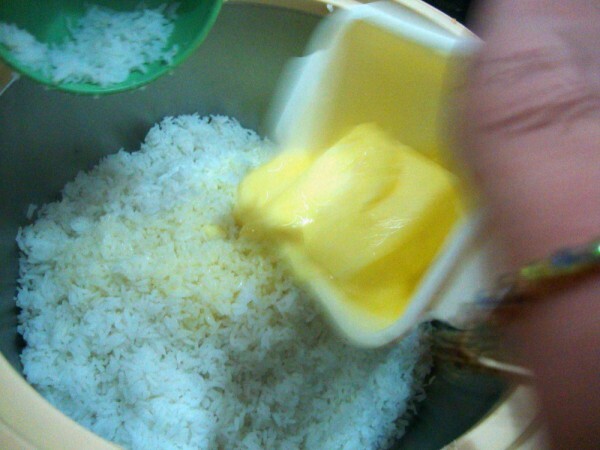 When we made with the cooked rice, mix the cooked rice with rice and keep it covered. 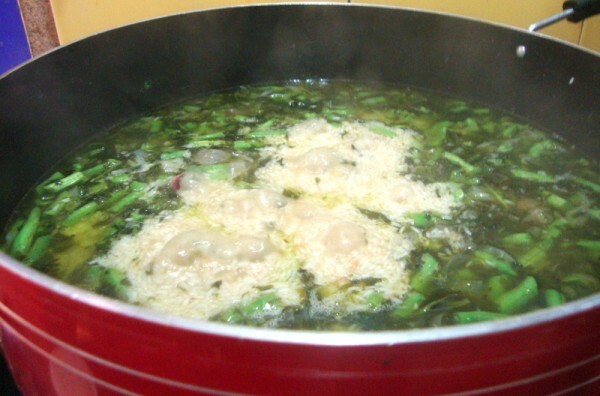 Make a sauce of the purple onions, with coriander leaves, then add tomato broth. 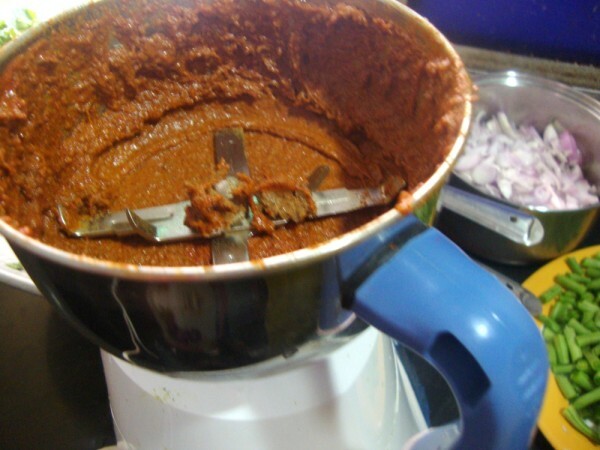 If you feel the spice is not enough, you can add red chili powder, mix in veg stock powder to it and add to the sauce. Cook well and finally add the tomato broth. 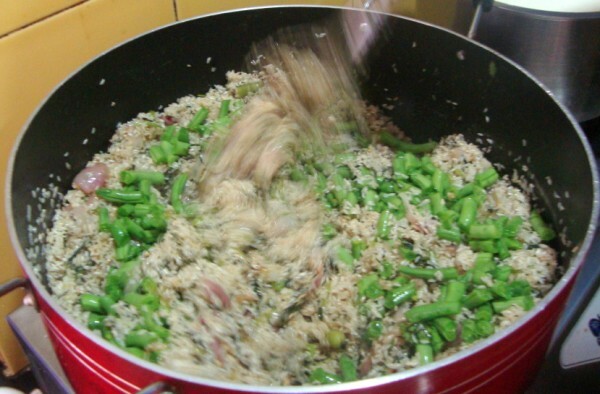 When everything comes done well, add to the cooked rice and mix well. Keep it covered for a while so that it gets mixed properly. Today is the last day of Blogging Marathon Edition 4. Though I initially had no plans to do all the three weeks, I decided I should do all the three and somehow managed covering all the days. For the next month, I will be announcing it shortly. Those of you interested, please be sure to sign in on time. It is so similar to our cooking style. 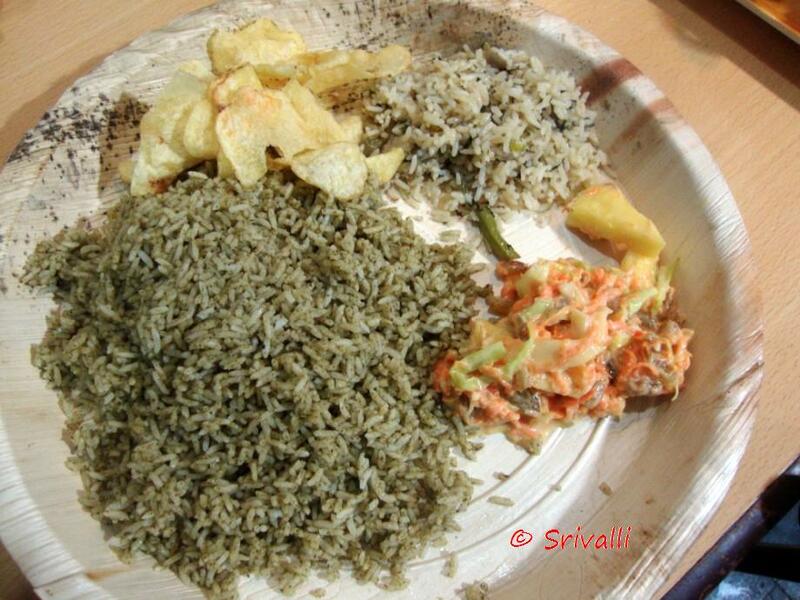 Thanks for sharing this wonderful recipe..
Yummy looking rice.. love with potato chips..
interesting recipe…..like the bean corn combination with tomato….. Unusual & looks super yummy!!! sounds delicious!….flavorful and yummy too! Cooking for 100. Thats wonderful. Nice recipe. It sure looks yummy. Love the last photo especially. I want to dig in. First time visiting your blog and I find a Rice with a Mexican flare. 🙂 And, yes our cooking is very similar. 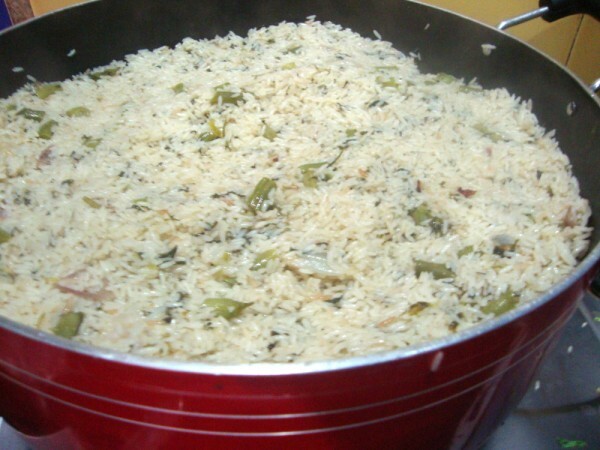 mmm…the cilantro rice looks so yummy! 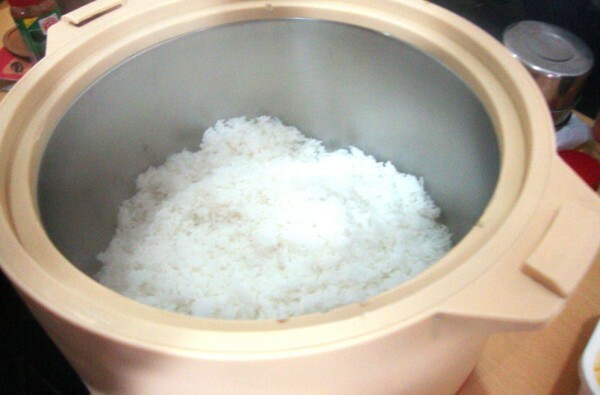 very interesting and wonderful rice !! 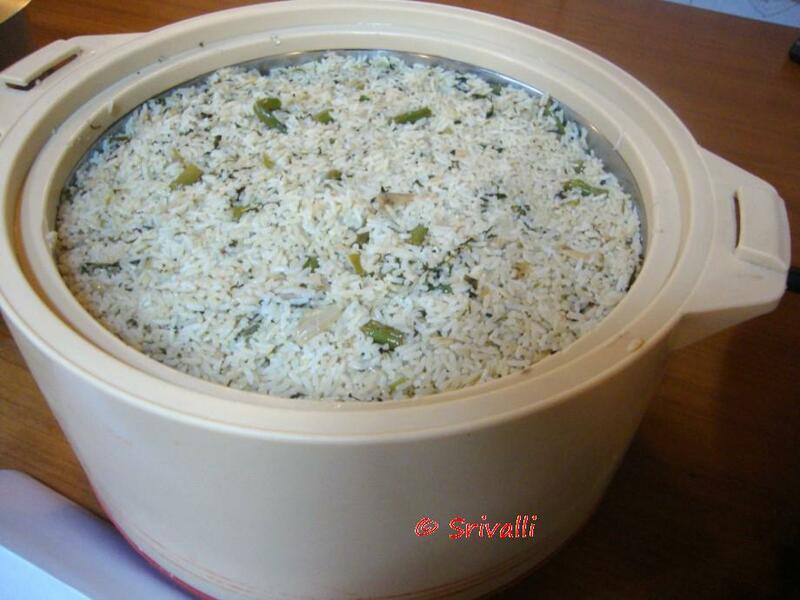 Very tempting and mouthwatering rice…. Mexican rice looks super delicious and simply inviting.. The mexican rice recipe sounds so different. looks colorful and yummy Valli.